May started off with a bit of a coup, an early 6V42 Tilbury to Trostre. the following day I was out on the hunt for Chiltern loco hauled trains and at the weekend a vist to Beggar's Bridge in the Fenland. The following week it was back to going out early for Chiltern's loco hauled trains plus my first site of the new S stock in service. On Saturday 14th I was out at Old Linslade for the early morning parade of trains starting with the Caledonian Sleeper from Glasgow and Edinburgh and ending with a pair of 86s on the 4L97. After over 40 years service London Underground’s 1967 stock on the Victoria Line is about to retire. To celebrate their life and times the London Transport Museum organised a farewell tour from Seven Sisters to Uxbridge and Ealing Broadway on Sunday 15th. 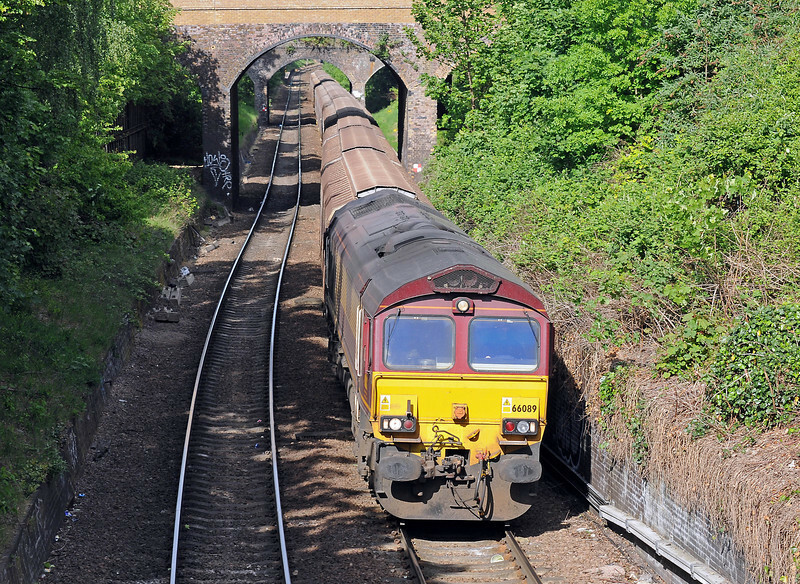 I ventured out west to take some pictures of trains which normally spend their working days underground. After a few days in North Wales (see separate gallery) we stopped off at Old Linslade for an afternoon's train watching. Very eventful as it happened, two extra Freightliners (Crewe to Ipswich and Thamesport to Crewe) plus the new GBRf Hams Hall service and 5043 'Earl of Mount Edgcumbe' on a charter from Brum to Euston. In the last full week of May I was out for Chiltern Railway's loco hauled trains and a chance picture of 7O81 with reefers among the Transfesa flats. On the last day of the month morning and evening visits to Neasden produced Chiltern loco and MU services and the indestructible A stock on the Metropolitan Line. A real result; the second 6V42 Tilbury to Trostre, empty vans from a delivery of tinplate bound for export. Due past Upper Holloway at 17:45 it ran over an hour early, appearing under Hornsey Road at 16:36, just after I arrived.